After a chance meeting in Boots, “feminazi” Joanna, who likes to be called Jo, begins a crusade to introduce the somewhat reluctant Alice, who does not like to be called Al, to all things gender equal. This includes inducting her into Jo’s start-up company, the world’s first revenge cupcake business, with a wacky staff of wronged women. Colette Eaton and Lucy Walker-Evans are both superb, flitting between portraying all the different characters and even swapping with each other with ease and skill. Eaton particularly excels as the more cynical Jo, both in her razor sharp delivery and in moments of brilliantly engineered physical comedy. The relationship between the two actresses shines through the two-handed piece and not only drives the heart of the play, but also helps them through some occasionally sticky moments (including when a microphone mistakenly taped down on press night forced Eaton to break into a spontaneous one-woman stand-up routine). Tightening up some of these tiny issues could really see Conquest triumph. The frenetic energy can get repetitive and making the most of the humour in the more frantically paced sections requires a slickness the production still needs to find. 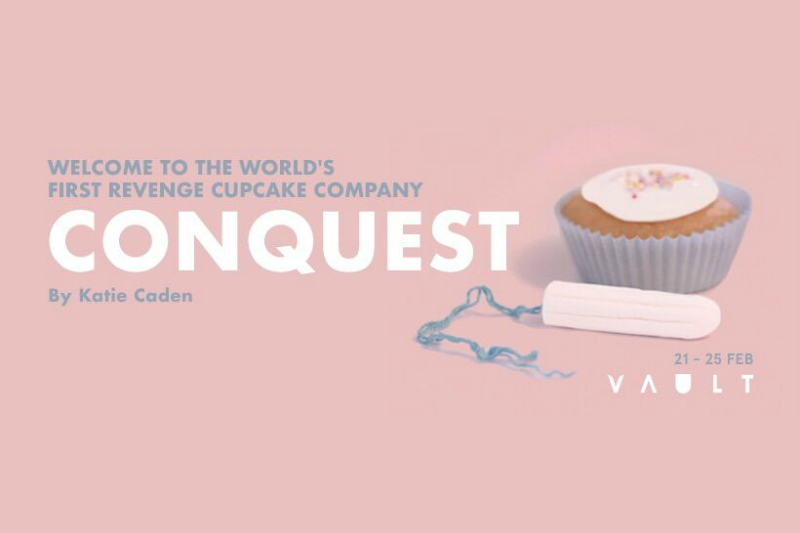 But as a nuanced discussion of the political and emotional minefield facing young women today, a witty takedown of some of the hypocrisies and contradictions of modern feminism, a celebration of female friendship and a tightly-scripted, laugh out loud evening, Conquest conquers all. Conquest runs through 25 February.